On November 10, 2017, Skidmore students Abigail Fuess ’18 and Sophie Heath ’18 interviewed artist Michael Joo as part of the course “The Artist Interview,” led by Dayton Director Ian Berry. Joo’s work Untitled (DRWN) (2012) from the Tang collection was on view in the fall 2017 exhibition Other Side: Art, Object, Self. You have a science background, and both your parents were scientists. Could you talk about growing up in that environment in terms of science versus art experiences? My mother likes to joke that I grew up in the labs before I was born. My parents were involved in food science and food production. They were from Korea, then came over to the States in the late 1950s/early 1960s. My dad was a cattleman and my mother was in seed science, so the labs I grew up with were hard-science labs as in my mother’s lab, but also farms, ranches, animal husbandry, breeding, things like that. So there was a really practical, pragmatic side to the abstraction in the laboratories. In many ways, everything was really specific: there was measurement, there was data, there was information. But it was really hard to see what was being pursued; a lot of things were invisible, but it leaped from the very specific to interpreting what’s going on. That might have something to do with how image and specificity and abstraction function in my own work. Do you find that your scientific background is something that holds your art back or allows you to express yourself in a unique way? I think of that idea a lot. In some ways, whatever you might call “science” in my work is just part of a language, either a methodology or an attitude, that I grew up with and can’t help. It informs some of the ways that I frame how I look at things. And sometimes it is a lead-in to how I might make sense of something. In grappling with it, I’m very conscious of it as a language, and it’s a language of authority. My art practice is informed to some degree by a certain amount of skepticism and questioning and interrogation of things. So what better thing to turn around and try to dispel or dissect than authoritative language such as in science. Could you talk about your artistic process with Untitled (DRWN), which is in the Tang collection? This work, in many ways, is emblematic of a lot of my sculptural practice, which often involves not an image, but a physical, sculptural, or manifested kind of material—in this case, casts of endangered crane species from Africa. Often with sculptures, their material qualities and their material properties are married with the form and don’t, in and of themselves, indicate an end to the life of the work—that is to say, the sculptures themselves don’t stop at the image or they don’t stop at the material. They often are an initiation of the question or an action that’s meant to be rejoined either by myself, the viewer, or maybe by time or space. I like the title to be open-ended. I definitely thought of it in all those ways. As an acronym, it implies that there’s a larger set of words potentially attached to this title. But it’s a little more physical. With a lot of my work, if you describe the materials or the way the work’s installed or even what it’s made of in a sentence, it might create a group of words that reads like concrete poetry. “Darwin” suggests an evolution, that the piece is always evolving. The work’s material is partly made of graphite that’s been stabilized with another material that binds it. So it’s a large marking instrument. It gets drawn every time it’s installed, and part of it’s left behind. If you do it enough times, this work would eventually disappear. Or maybe the piece evolves to nothingness, just like the idea of this particular specimen on which the sculpture is based might have a kind of transient or fleeting time in a larger picture as well. Untitled (DRWN) is one set of crane legs, and you have similar works that are multiple sets of crane legs. What is the meaning of multiples in this work? The crane leg came from a biologically collected specimen by scientists. I was allowed to cast that specimen, but it was only one leg. I cast one leg of that crane and then laser scanned, or digitally scanned, the actual leg. So there was one casting happening on a material level, and then there was image making on a digital level, and then we took that into the computer, flipped it around and made a carbon copy—or a clone, or a facsimile, however you want to see it—of that original leg. If you look at the two of them, one is softer in nature because it’s a rendering. I was interested in some of that softness. It’s second generation. And in some ways, the data it carries is accurate, but only as accurate as the original. And then the two of them were cast again, made into molds. With this particular piece, the idea of the individual disappearing was important. What is the significance of the legs of the crane? Why did you choose that part specifically? The way that we understand cranes is partly in flight and partly on the earth. The legs are left after the fact and are only part of the equation of this animal and its identity. And the other part is that it does touch the material plane. It’s the thing that we can relate to the most in some ways, and it holds up the body. It’s the base and the terms of movement. In my work, movement and energy and such are together; that movement is another part of motion and choice. You’ve talked about the Demilitarized Zone (DMZ) in Korea and how seeing cranes in a natural habitat there as well as seeing all of the species that survive there was inspiring to you. You described it as another world or a paradise. When you go to the DMZ, you cross over into an area called the Civilian Control Zone (CCZ) first. That’s a kind of soft area where farmers actually farm the land, and people with special permission can go there. The actual DMZ is pretty hard-core and, literally, your backs are to guns that point into the DMZ. Once you cross that threshold, you’re looking at the edge of an area that is not only off-limits, but that maybe doesn’t really exist, a band that doesn’t have the identity that’s fixed. Coming up to that area, I take all that with me in theory and in concept. It’s backed up by a landscape that really hasn’t been groomed or touched or affected because there’s so little intervention on the visual plane. Its profile, the species, the trees, everything is a little bit different than what you’ve just experienced in the rest of the country and on the peninsula. I’ve collected samples of volcanic rocks from the edge of that to engage in stories of where those rocks might come from. Is there a volcano in the DMZ? That’s another question. And if there is, there’s this very hard, factual rock talking about some kind of mythological piece of geology. In some ways, that’s largely how I think about Korean nationalism or ideas of nationalism. I’ve been interested in ideas of whether nationalism is a virus or a recessive gene or trait. So the ways that we look at some of the feelings we have, some of the things that we assign to our own view of place and identity in that environment was of interest to me. The DMZ has this very puzzling aspect of being a product of man’s most impulsive, destructive qualities yet it has preserved so many lives of animal species. Does this juxtaposition show up in your work in any specific ways? Definitely, yes. The DMZ is the most heavily guarded wildlife preserve around. But I don’t know if those qualities are contradictions as much as they are intersections and collisions of what we’re capable of. Usually we manicure all the edges of how things meet; we’re quite good at that as people, as species. In this case, it’s one of those zones of slippage where we have a lot of these collisions. Usually, we only see them at times of utter crisis, natural disaster, or war, or oppression. But in this case, it’s been somewhat restrained and controlled and carries a certain tension to it. I could only hope that some of those things are part of the work for me. Multimedia artist Michael Joo has had numerous solo and group exhibitions in the United States and abroad. Joo represented South Korea at the 49th Venice Biennale in 2001 and was awarded the grand prize at the sixth Gwangju Biennale in 2006. In 2012, he was a Smithsonian Artist Research Fellow, studying 3-D scanning and the relationship between art and technology. He holds a BFA from Washington University in St. Louis and an MFA from Yale University. Originally published in Accelerate: Access & Inclusion at The Tang Teaching Museum 2 (2018). 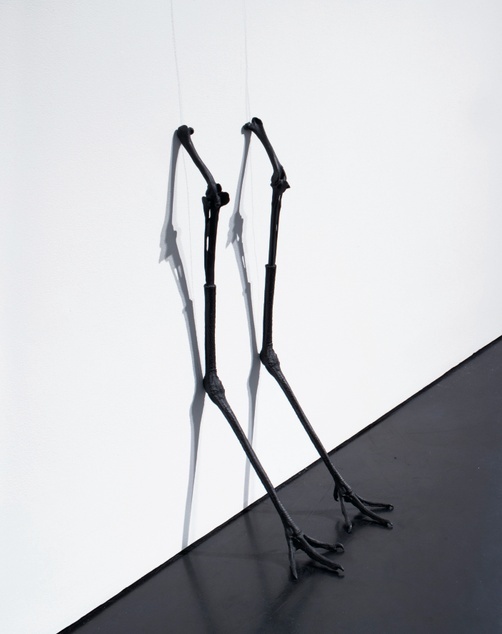 “Michael Joo on Science, Art & the Symbolism of Crane Legs.” Interview by Sophie Heath and Abigail Fuess. Tang Teaching Museum collections website. (https://tang.skidmore.edu/collection/explore/54-michael-joo).